Venom’s a character that’s had a number of divergent design styles over the years. When he first appeared, he was a slightly bigger than average, but not particularly huge character. Like with Peter Parker, the symbiote didn’t initially do much to alter Eddie Brock’s physique at all. However, as art styles changed over the course of the ‘90s, Venom became more and more extreme. His proportions relative to Spider-Man became much more exaggerated, as he became an imposing figure rivaling the likes of the Hulk (who had, admittedly, undergone a bulk-up of his own over the years). Hasbro’s standard take on Venom does its best to be a moderate take on the character, but ultimately airs more on the smaller side. We haven’t seen a truly monstrous Venom at his most absurd in quite some time, if ever. 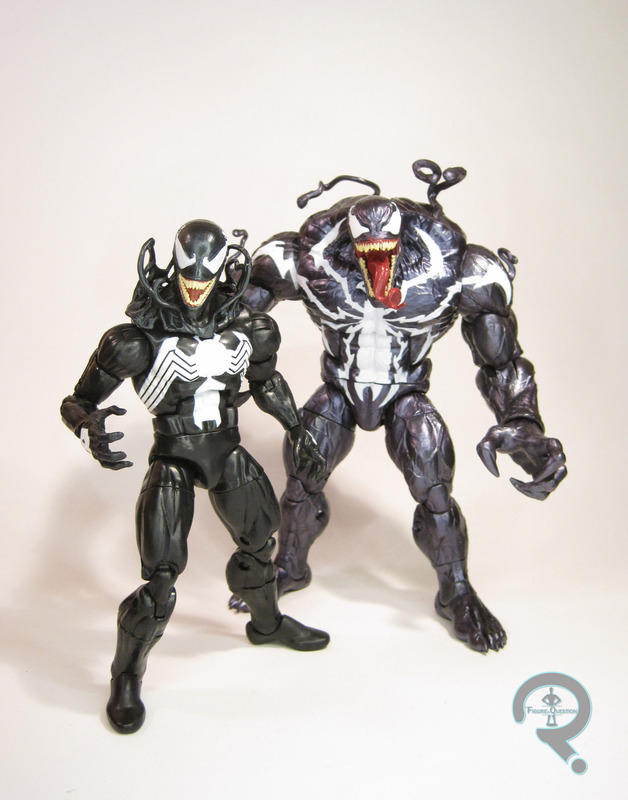 Monster Venom is the Build-A-Figure for the new Venom-themed assortment of Marvel Legends. He’s patterned not on an Eddie Brock version of Venom, but instead on Mac Gargan’s time in the symbiote from a few years back. He looks to be based on Mike Deodato’s version from Thunderbolts, as he lacks the actual “eyes” that most artists gave Mac. Of course, this allows him to keep the more classic Venom eyes, which I’m more of a fan of anyway. The figure stands 7 3/4 inches tall and he has 30 points of articulation. Monster Venom’s nature as a Build-A-Figure allows him to not only be a much more massive figure than a single release, but also, by virtue of having his cost spread out across an entire assortment, allows for him to a completely unique mold. And what a mold it is! If you felt that the standard Venom was a touch too simplistic, or basic, or just not dynamic enough, hoo boy is this the figure for you. The head takes the tongue-flicking head from the last Venom release, and dials that up to 11, with a practically unhinged jaw, a wildly moving tongue, and everyone of his teeth out for the whole world to see. The body is covered in veins, just all over the place, to insane levels. On any other character, this would look ridiculous, but on Venom it’s nothing short of amazing. He’s got tendrils coming from his back and shoulders, and thanks to the unique sculpt, they don’t have to be one piece that plugs into a single port like on the smaller figures, allowing them to be worked in much more smoothly. And then there’s the general build of the figure. He’s absolutely huge, easily living up to the “Monster” part of his name. On top of that, though, his articulation’s not nearly as restricted as you’d expect it to be. In fact, there are a number of deep poses he can get into that his smaller counterpart struggles with. They definitely stepped up their articulation game here. Even Monster Venom’s coloring is a step-up from the standard version; rather than the straight black and white of the basic Venom, Monster Venom is done up in this sick metallic purple. It gives him a seriously alien vibe, and definitely is a good match for more recent depictions of the character. 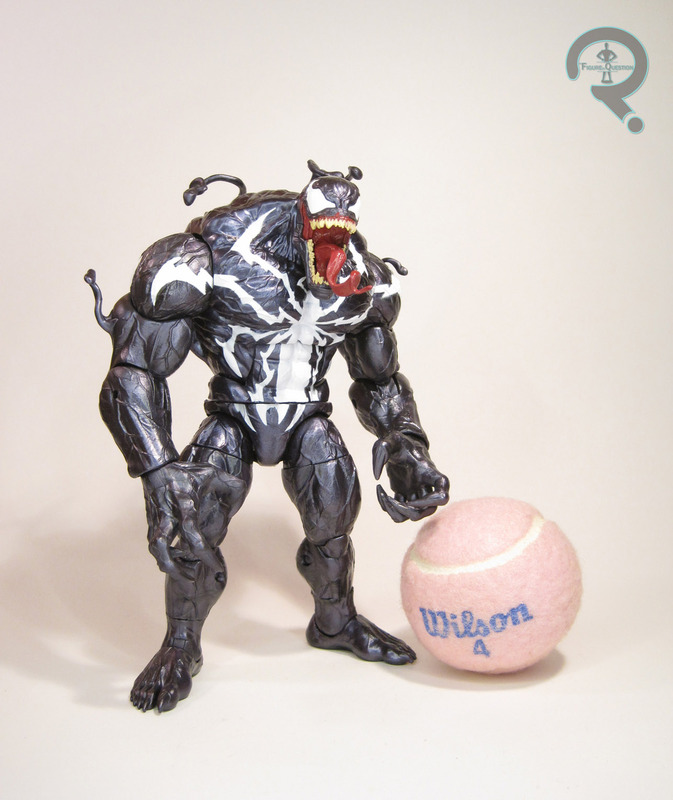 He also gets the slightly tweaked logo that Gargan’s Venom sported, which gives him a more unique appearance from the main Venom, but is still close enough for the casual observer to recognize. Monster Venom has no accessories, but given his size and status as a Build-A-Figure, that’s not a surprise, or a let-down. 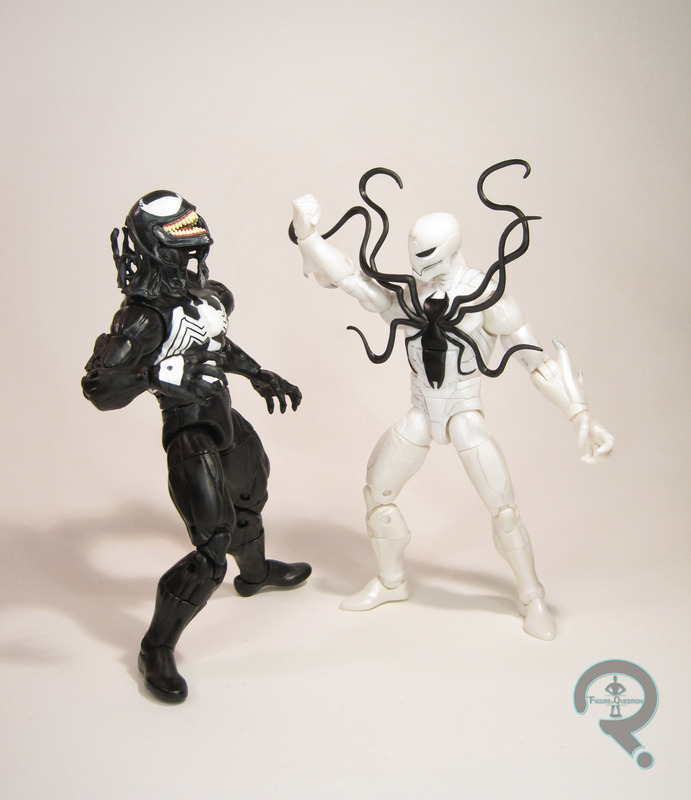 When the figures from this assortment were initially shown off, the name “Monster Venom” started floating around for the Build-A-Figure, but exactly what that name meant was a little unclear, so I had no idea if I’d be getting this one or not. Of course, as soon as he was shown off, I was incredibly impressed, and knew right away I wanted one. Thanks to my friends at All Time Toys (from whom you can still order 5 of the 6 figures in this series) I was able to get a full set put together and get myself a Monster Venom assembled. This assortment is kind of an interesting experience. Going in, I was only interested in the Build-A-Figure and two of the six figures required to build it. I wasn’t even sure I’d be completing this figure, but All Time got them in, and I’m an easy mark. 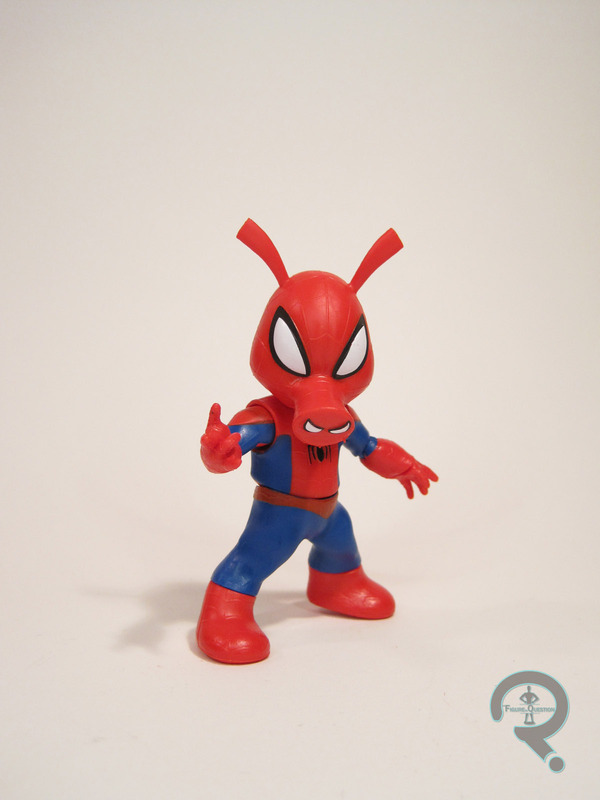 Spider-Ham, the figure I most wanted, is the set’s biggest disappointment for me. Scream, my other big want, is decent, but nothing to write home about. Poison and Typhoid Mary, on the other hand, far exceeded my expectations, with Poison in particular being my favorite of the bunch. And, above all, I just can’t help but enjoy this set as a whole. They go well together. Okay, let’s be real up-front here: that bio up there? About everything I know about Typhoid Mary. She’s a character that I’ve almost entirely managed to miss in my time as a Marvel fan…so, let’s go into this review kinda blind, shall we? 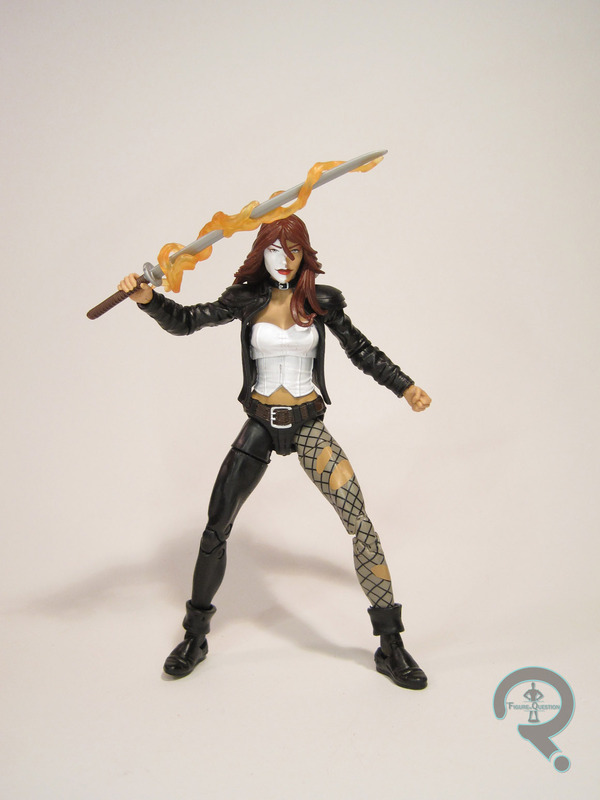 Typhoid Mary is figure 6 in the Monster Venom Series of Marvel Legends. She’s definitely the figure in the assortment with the most tenuous ties to Venom…I think she’s met Spider-Man a few times, and certainly Daredevil, but I don’t know that she and Venom have ever interacted. There’s a rumor floating around that Mary was originally supposed to be part of a proposed second series of Marvel Knights figures, which was ultimately scrapped, and the figures shifted elsewhere. Given her appearance in Iron Fist Season 2, that would actually make a fair bit of sense. Mary has had a number of looks over the years. This one is a more recent, more reserved design, taken from her recent turn as part of the Sisterhood of Evil Mutants. 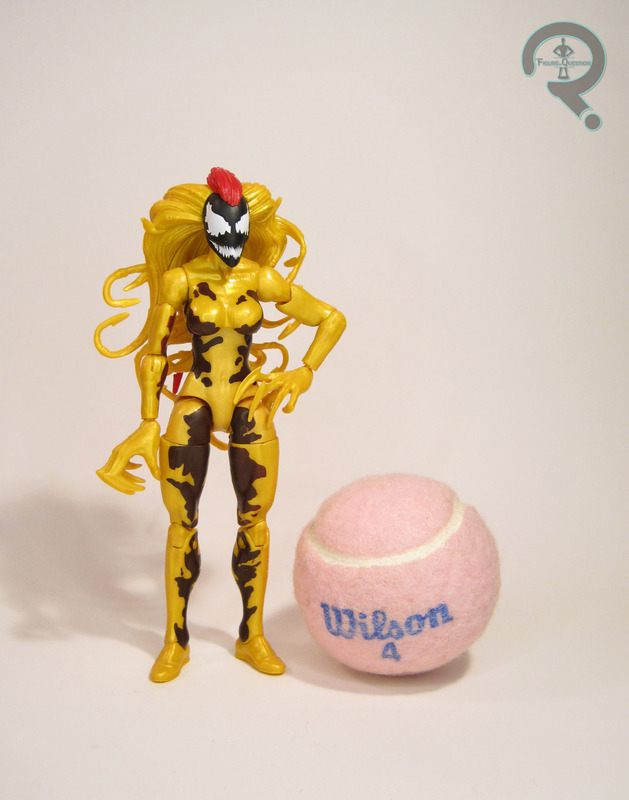 I might have been more interested in her ‘80s design, like the old Toy Biz figure used, as this one’s a little generic, but it’s not a terrible design. The figure stands 6 inches tall and she has 27 points of articulation. She’s built on the Phoenix body technically, but the only parts from that she actually uses are the legs and feet. The head, torso, jacket, arms, pelvis, and boot cuffs are all new. I’m going to guess that we’ll be seeing a number of these parts crop up elsewhere down the line, but whether we do or not, they’re quite nicely sculpted pieces, and they make for a nicely put together figure. In particular, the head is definitely one of Hasbro’s more unique offerings; the slight smile she’s got is a really nice touch. The only real downside I feel is the posabilty in the arms, which are rather restricted at the elbows. After the recent improvements on such designs, it’s a little bit of let-down. The paintwork on Mary is pretty decent. Like the rest of the assortment, she’s rather on the monochromatic side, with lots of black and white. It’s a pretty striking look. There’s a little bit of slop on the white side of her face, but it’s minor, and the hair mostly distracts from it. Mary is packed with a katana with a fire effect; the whole thing is the exact same set of pieces used with the Psylocke figure, but I find myself liking it a lot more when in these colors. The only downside is that Mary’s right hand’s grip is a little too loose to properly hold it. Some heating and reshaping of the grip is probably in her future. The figure also includes the left leg of Monster Venom, who I’ll finally be looking at tomorrow! Mary was the last figure to be shown off from this assortment. I don’t know the character, and I don’t find this look all that exciting, so I really wasn’t invested in getting this figure. But, as with the rest of this assortment, I wanted Monster Venom, so I was at least grabbing her to get the piece. I’d thought I might try to sell her off after the fact, but upon seeing her in person, I was actually quite pleasantly surprised by how well she’s turned out. Typhoid Mary was purchased from my friends at All Time Toys, and is still available here. If you’re interested in buying other Legends figures, or are looking for other cool toys both old and new, please check out their website and their eBay Store. Hey, do you guys remember Lasher? Yeah? Well, let’s continue down that path, huh? Lasher was, of course, a spin-off of a spin-off of a spin-off, but it’s important to note that he was just one of *many* symbiotes to be spawned at that same time. He wasn’t even the most prominent of the bunch! That title goes to today’s main focus, Scream. Scream made it big largely thanks to Universal Studios, who wanted to feature another female villain for their 3D Spider-Man ride, and happily added Scream, extending her shelf life far beyond the rest of the spin-offspring. Throw in an appearance in the Venom movie, and you’ve got yourself a natural fit for a brand new Marvel Legends release. 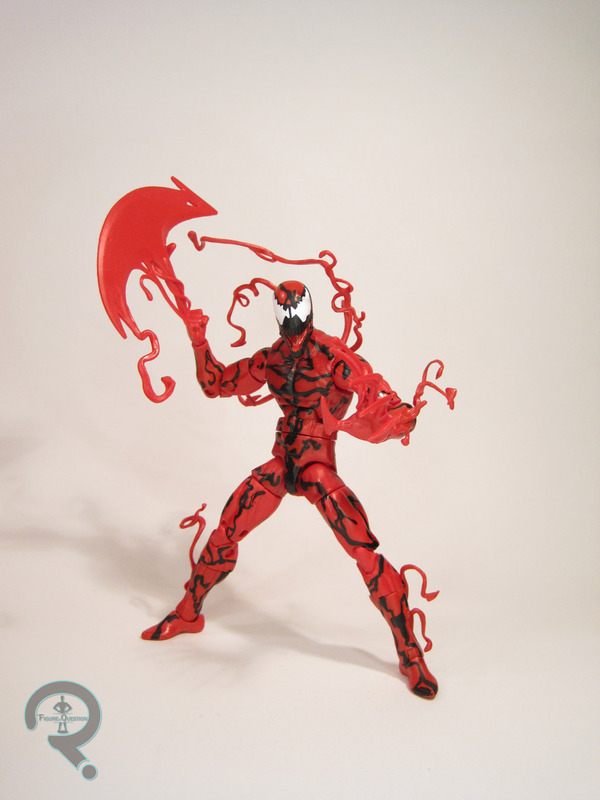 Scream is figure 5 in the Monster Venom Series of Marvel Legends. 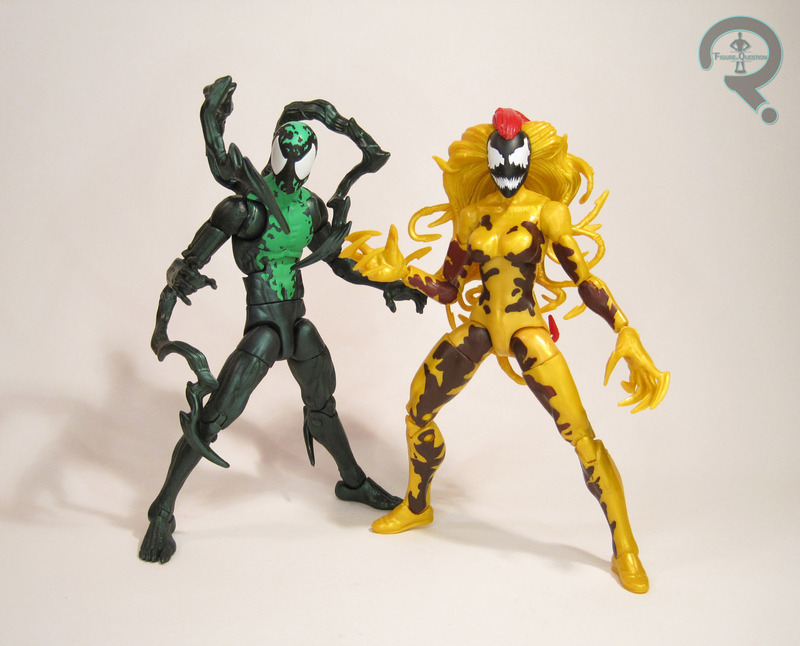 She’s the second of the Life Foundation Symbiotes to get the Legends treatment, following the previously mentioned Lasher figure. The figure stands 6 1/4 inches tall and she has 28 points of articulation. Scream is built on the Moonstone body, which has been appearing rather infrequently. It’s last use was for Lady Loki in the A-Force set. For Scream, it does seem like a slightly odd choice, especially over one of the more posable bodies that have been introduced more recently. It’s certainly not a bad body, but that lack of mobility on the neck is a bit of a bummer. I’m hopeful this one’s on its way out. Appearance-wise, it’s not terrible for Scream. Being from the ‘90s, she does benefit from this body’s curvier figure, and the really thin waist doesn’t look quite so out of place. 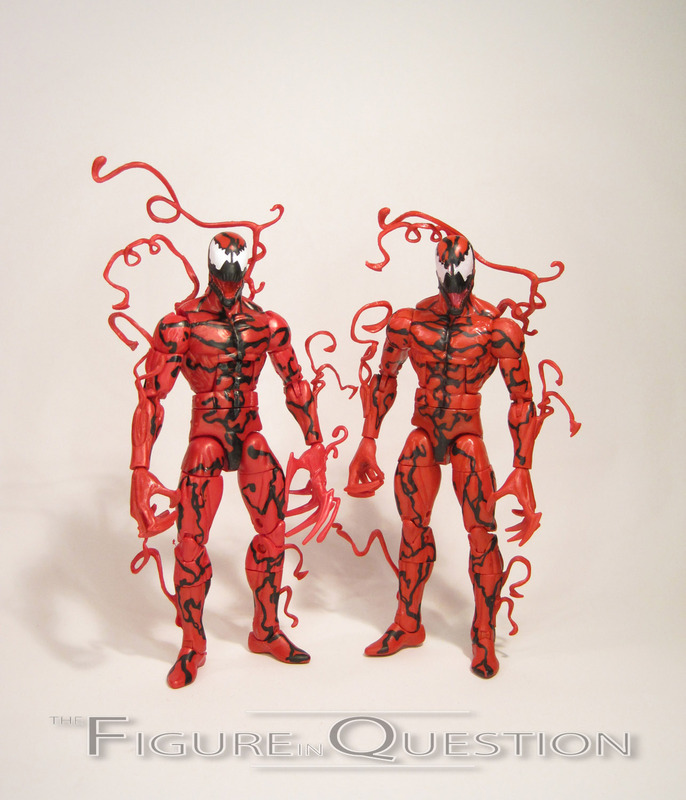 On top of the Moonstone body, Scream rather wisely re-uses Carnage’s hands, and also gets a brand-new head sculpt. The head’s obviously the star piece of the figure, and it does a rather respectable job of capturing Scream’s distinctive noggin from the comics. I do wish it sat a little higher on the neck, but it’s otherwise quite a nice piece. Scream’s paintwork is fairly decent; in their original appearances, each of the five spin-offspring was done up in one main color, with a bunch of goopy, swirly black, in a similar fashion to Carnage. As she continued to appear, Scream gained some more definition to those darker patches, which were now a reddish brown. This figure draws from her later designs, making her a little smoother and sleeker than the Carnage from this same assortment. 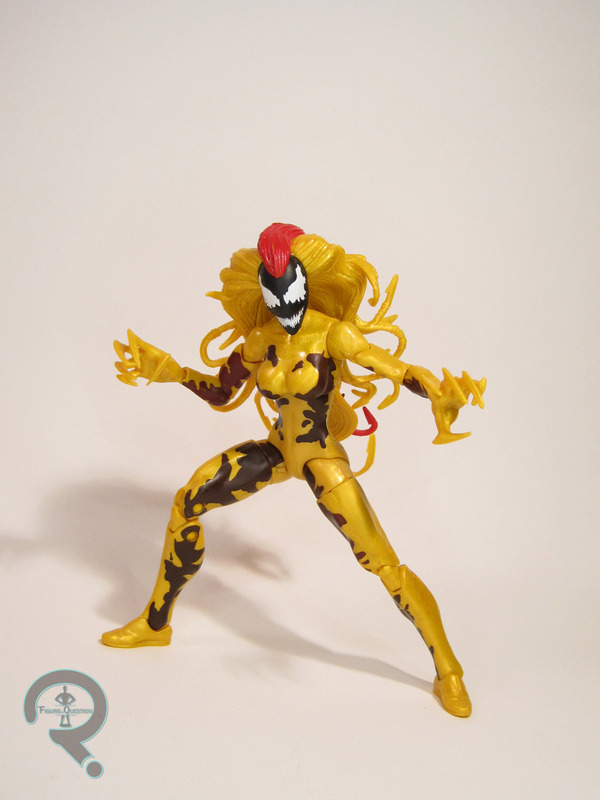 The slightly metallic yellow plastic also means that she fits in pretty well with the similarly colored Carnage and Lasher figures, and helps give her symbiote that otherworldly appearance. Scream gets no accessories specifically for her, but she does include the right arm of the Monster Venom Build-A-Figure, which is still pretty respectable. As noted in yesterday’s Spider-Ham review, there were two figures I knew I’d be getting when this assortment was first shown off. Scream was the second of those. After getting Lasher, I was pretty excited by the prospect of the other Life Foundation symbiotes showing up, and Scream was definitely high on the list. She’s an okay figure. I can’t say I was particularly wowed by her the way I was with Lasher. That said, as soon as I knew she was on the Moonstone body, I knew what I was getting, and I certainly can’t say she disappointed me. If nothing else, she looks pretty darn cool with Lasher, and I can’t wait to further build this subset. Scream was purchased from my friends at All Time Toys. If you’re interested in buying other Legends figures, or are looking for other cool toys both old and new, please check out their website and their eBay Store. Spider-Ham? It’s come to this? I’m reviewing a Spider-Ham figure? Yeah, I know, I’m as shocked as the rest of you. Even with his elevated status as a variant of Spider-Man, I don’t really know that I ever expected to review a Spider-Ham figure. Of course, I say this as a guy who just reviewed Poison, a character with far, far less comic book appearances than the esteemed Mr. Porker here, so maybe I’m just overreacting. Spider-Ham is a 1983 creation, parodying Spider-Man through the lens of an anthropomorphic cartoon animal. He began his life as a spider, before being bitten by a radioactive pig, causing him to turn into a pig, while still retaining many of his spider abilities. He’s actually been a pretty recurring staple at Marvel since his creation, and in 2016 met up with his main universe counterpart during the Spider-Verse cross over. 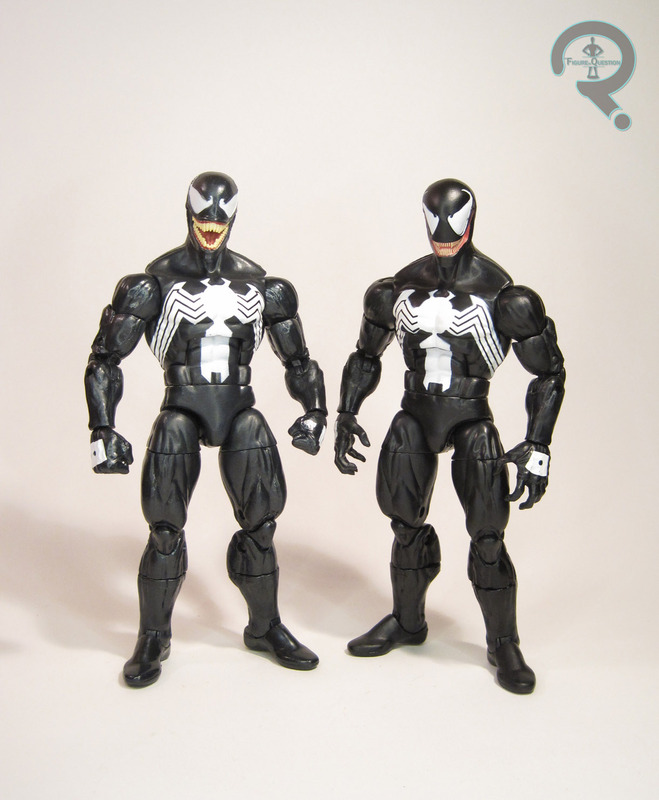 Spider-Ham is figure 4 in the Monster Venom Series of Marvel Legends, and perhaps the one figure in the series who feels more like a straight Spider-Man character than a Venom one. I guess they just really wanted a counter for all of the ‘90s X-treme-ness that was oozing from the rest of the assortment. The figure stands 3 inches tall and he has 14 points of articulation. Okay, so let’s just rip the band-aid right off, shall we? Spider-Ham’s biggest failing, by a country mile, is his articulation, or rather his lack thereof. While his upper body is fairly decently articulated (though it’s not as smoothly integrated as I’d like; his arms end up with quite a segmented look), the legs only have simple cut-joints at the calves, and nothing more. That splayed leg position is all you’re getting out of him. This is a sincere let-down, especially after Hasbro had just last year addressed a similar problem with their original Rocket Raccoon, and released a fully articulated version for Vol. 2. There are some characters for whom I could forgive the missing articulation, and I could even forgive it on Ham if he were a pack-in figure or something, but as a single-release figure, this is ridiculous, and quite a step backwards. In addition, Hasbro seems to be aware of the potential problems with releasing such a small-statured figure on his own, and has subsequently upscaled him a bit, making him too large to properly scale with other figures. It’s a minor thing, given how infrequently Ham interacts with other characters, but it’s still annoying. Beyond that, his sculpt’s okay. 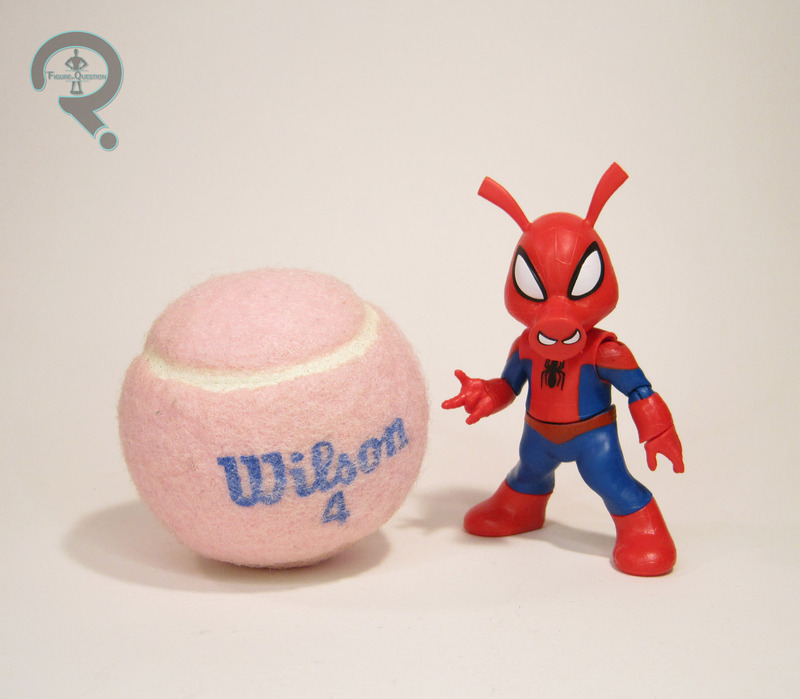 The internal proportions are fine, and he certainly looks like Spider-Ham. The choice to go with sculpted webbing, something that all of the recent Spider-Men have forgone, is sort of an odd one. It looks fine, but it’s anyone’s guess as to why Hasbro chose this of all figures to give that treatment to, especially since it removes their option to do any black-costumed variant down the line. I think the oddity of the choice is further highlighted by the decision to leave the webs unpainted, making them easy to miss at first glance. Also, they’ve used painted red for exactly one part of the figure, his belt, and it’s so obviously a different tone from the rest. Why not just paint the legs instead? Another mystery. 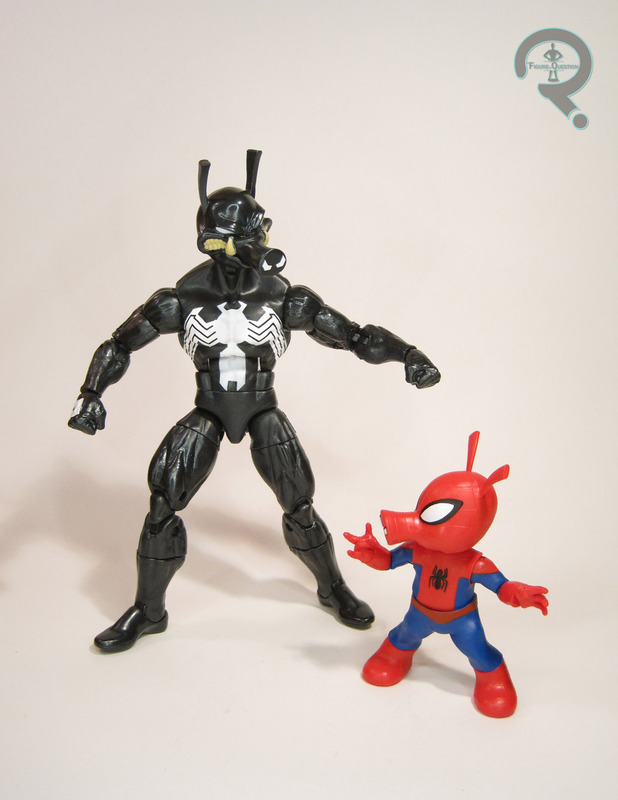 Spider-Ham includes two accessories, neither of which is actually for him. The first is the head of Pork Grind, the Venom to Ham’s Spider-Man. It’s a really nice piece of work, and has been designed to be compatible with the standard Venom from this same assortment. It’s a nice bonus for those of us who had the Absorbing Man release, and by far my favorite thing about this figure. Secondly, Ham includes the largest piece of Monster Venom, the torso. Hasbro used this same pack-out style for both versions of Rocket, so it’s not a huge surprise here. While I certainly appreciate the two pieces included, given the smaller size of Spider-Ham, I’d have loved to see some extra heads and hands and maybe even a webline thrown in to sweeten the pot. I was so excited when Spider-Ham was announced. He was one of the two figures in this set I was certain I’d be getting. The prototype shots made me slightly apprehensive, but I’ve learned not to judge a Legends release by the prototype. And then I got him in hand, and, well, most of my my problems were still there. I really, really wanted to like this figure, but the simple fact is that Hasbro dropped the ball pretty hard on this guy. I wish that weren’t the case. I wish I could say this was another win for Hasbro, but this figure honestly showcases a number of problems that we haven’t seen from Hasbro in years, and I wouldn’t mistake someone for thinking he was a pre-Return of Marvel Legends release. I don’t hate him, because I genuinely can’t bring myself to hate a Spider-Ham figure. I’d rather have this than nothing at all, and I can enjoy him for what he is, but I’m sad that he doesn’t live up to Hasbro’s current standards, and I’m sad that he’s not this Series’ logical star like he should be. Spider-Ham was purchased from my friends at All Time Toys. If you’re interested in buying other Legends figures, or are looking for other cool toys both old and new, please check out their website and their eBay Store. Guys….I’m gonna critique the bio for a sec here. I know, I keep promising I won’t, but it’s sort of important. So, the “living miracle” “back from the dead” “gave up the Venom identity” Peter Parker, aka Poison, mentioned in the bio appeared in What If? Spider-Man: The Other in 2007. He is *not* the character this figure is based on. This figure is instead based on the Peter Parker Poison from last year’s Venomverse, where a symbiote-wearing Peter Parker was one of the first victims of the host-devouring symbiote hunters known as the Poison. In Hasbro’s defense, neither character is anything bordering on major, so they can be forgiven for some slight confusion. Now, let’s get onto the figure, shall we? 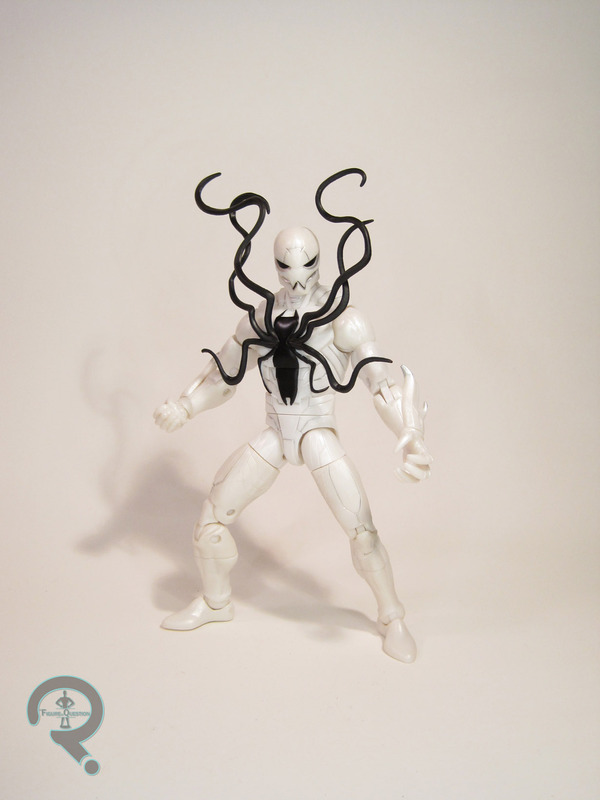 Poison is figure 3 in the Monster Venom Series of Marvel Legends. After the pretty obvious choices of Venom and Carnage, Poison is undoubtedly out of left field, given he’s got, what, three appearances? If that? But, I guess if Hasbro’s content to give us every single Spider-Man from Spider-Verse, it shouldn’t be a huge shock to see them dipping into Venomverse as well. The figure stands 6 1/2 inches tall and he has 32 points of articulation. Poison is built on the Spider-UK body, which is a favorite of mine. That said, he actually gets a surprising number of new pieces. He only actually shares his upper arms and lower legs with the standard body; everything else is brand new. This allows for the figure to properly replicate Poison’s inorganic, exoskeleton-like appearance. It serves as quite a nice counterpoint two Venom and Carnage from the last two days. I definitely dig all of the etched detailing work on his torso, head, and upper legs as well; its something that could have easily been overlooked. The tendrils mounted on the front of his torso showcase the last traces of the symbiote Poison assimilated, and while they can be a little odd to work with at first, they certainly do add a unique flair to him. Poison’s color work is more involved than you might think; he appears just straight white and black at first, but the white is actually a slightly pearlescent plastic, and there’s some light silver accent work running along yhr engravings, giving them a nice extra bit of pop. It’s a small touch that really adds a lot to the figure. Poison includes no character specific accessories, but he does still get the left arm of the Monster Venom Build-A-Figure, which is certainly a sizable piece. I had no clue who Poison was prior to this figure being shown off, and therefore didn’t really think much of his announcement or really plan on picking him up. Like the last two days, it was really that Monster Venom piece that was pulling me in. That said, after getting all of the figures in hand, Poison is undoubtedly my favorite of the set. There’s just so much coolness going on with the design, the sculpt, and the paint. Who would have ever thought a character like this would get this sort of treatment from Hasbro? Poison was purchased from my friends at All Time Toys. If you’re interested in buying other Legends figures, or are looking for other cool toys both old and new, please check out their website and their eBay Store. Though roughly 20 years newer than the rest of Spider-Man’s most popular foes, Venom has undoubtedly made a home for himself in the mythos, and in fact made something of his own mythos. How else can you explain the guy getting a whole series of Marvel Legends devoted to him. Oh, right, movie. Well, he’s also got the movie, I guess. Look, the point is, there’s a new series of Venom-themed Marvel Legends, and I’m totally reviewing them, starting with the main man himself. 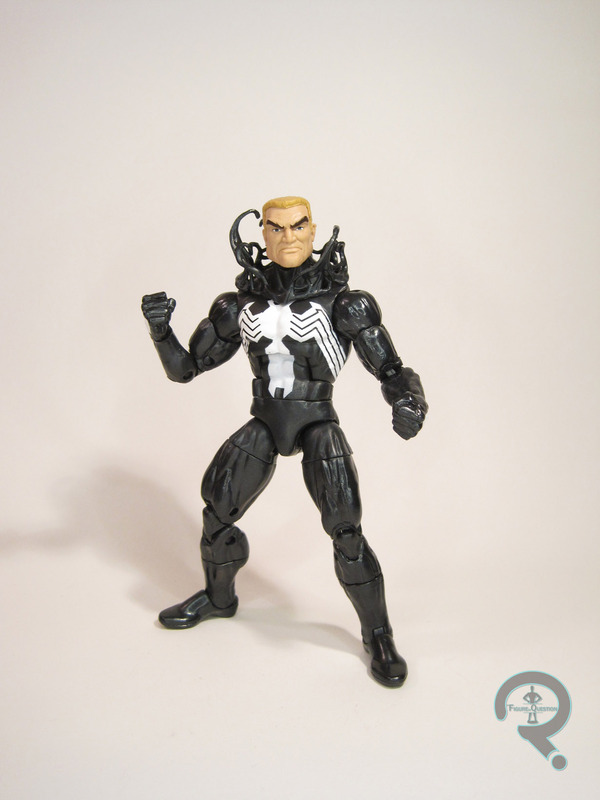 Venom is figure 1 in the Monster Venom Series of Marvel Legends. This assortment is the Spider-Man equivalent to how the loosely-Deadpool-themed Sasquatch Series was kind of an excuse to get more X-Men characters. Anyway, this particular figure doesn’t do a whole lot of new stuff. He’s really just a slight re-working of the Absorbing Man Series Venom. That was a pretty solid take on the character, and he didn’t need a hard re-do, but given slightly higher aftermarket values, a re-release isn’t unwarranted, especially if the movie further elevates his profile. The primary difference between these two figures is the head, or rather heads. There are two of them: an unmasked Eddie Brock, and proper masked head. The Eddie head is the most outwardly different, and does an alright job of capturing the spirit of McFarlane’s take on the character without getting too overly stylized. My big complaint is that it’s a little bit on the large side, especially when compared to other figures. I’m not sure I really buy that Eddie’s head should be almost twice the size of Peter Parker’s. The masked head is kind of a halfway point between the two included with the last figure, so he’s got an open mouth, but doesn’t have the crazy tongue. Of the three masked Venom heads we’ve gotten, this is definitely my favorite. He also gets a new add-on piece; a set of tendrils that slips over his neck. It works best with the unmasked head, but doesn’t look too bad with the masked head either. His paint is also ever so slightly different from the prior release; the finish on the black sections is shinier and a little bluer than the first release, though it’s not really different enough to prevent reasonable swapping of pieces between the two figures. 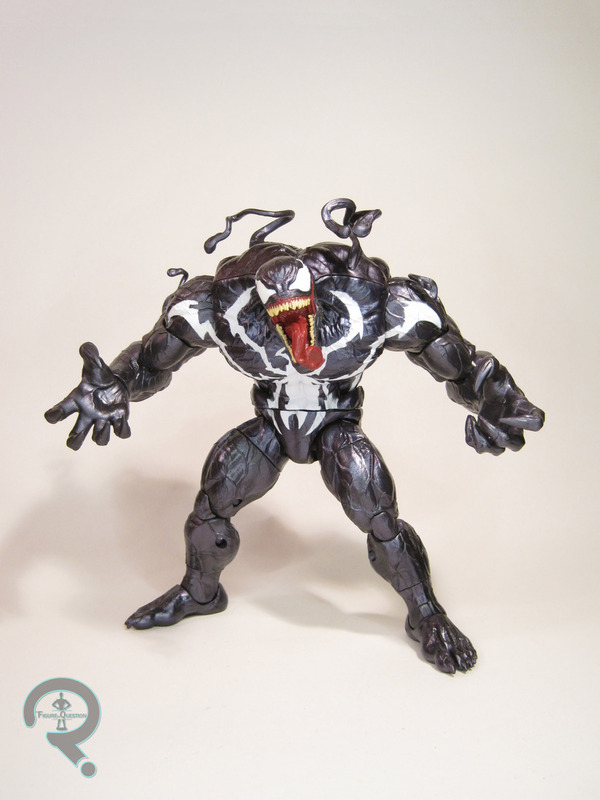 Outside of the extra head, Venom is also packed with the right leg of the Monster Venom Build-A-Figure. He lacks the extra set of hands like the prior figure, which is slightly disappointing, though I guess the larger BaF piece somewhat makes up for it. Since I got the original release of this guy, I really wasn’t sure I’d be grabbing this one, especially since he was originally rumored not to even be including a BaF piece. That of course didn’t prove to be the case, and since I wanted Monster Venom, this guy had to come along. I’m actually not too unhappy about the extra of him. The new pieces offer a lot of value to the original, and the Pork Grind head included with Spider-Ham means having a spare body isn’t the worst thing. Plus, now he’s much easier for fans joining in a bit later to get ahold of, which is the most important thing. 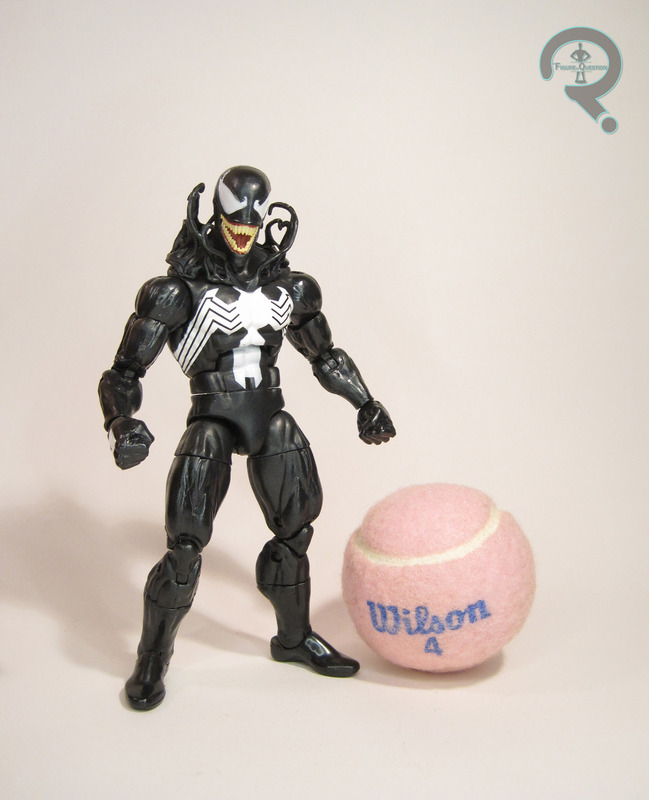 Venom was purchased from my friends at All Time Toys, and is still available here. If you’re interested in buying other Legends figures, or are looking for other cool toys both old and new, please check out their website and their eBay Store.